The village of Trearddur Bay, formerly known as Towyn Capel or Tywyn y Capel, is situated south of Holyhead on the west coast of Holy Island, Anglesey. 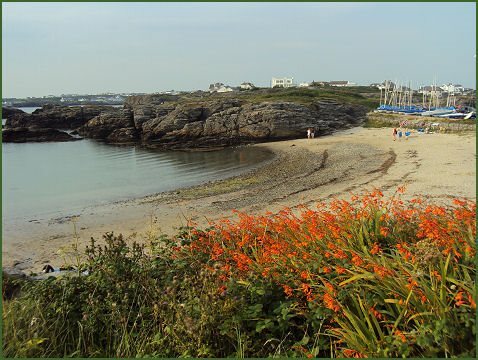 The large main beach at Trearddur Bay is one of Anglesey's premier beaches, with rocky outcrops containing rock pools, the beach has an excellent quality of water and holds the coveted Blue Flag Award. It is popular for lots of water sports, including canoeing, surfboarding, and water skiing. At the centre of the beach lies an ancient burial ground which was excavated in 2003. A Celtic cross, erected on the Promenade during the Millennium commemorates, Saint Ffraid, the patron saint of Trearddur Bay. The village has a number of amenities, including shops, several pubs, cafes and restaurants, a garage, two golf courses (one 18-hole, and one small 9-hole), and many hotels. Boat trips & fishing trips are available from the beach. Horse riding is available, as well as a snooker hall at the Beach Hotel. 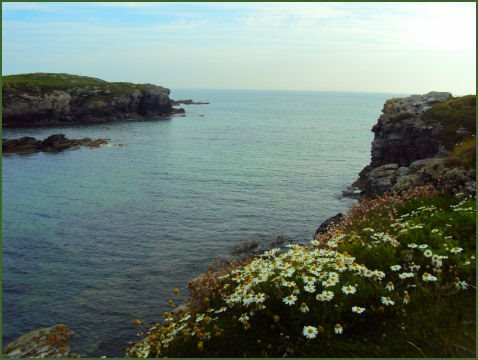 The Anglesey Coast Path passes through the village, a 200-kilometre (124 mile) long distance footpath which follows nearly the entire coastline of the island. A walk to the north north leads to the pretty cove of Porth Dafarch and the panoramic South Stack Lighthouse.